Those of us who have grown up in the industrialized Western world have been fed a steady diet of faith in progress, dating back to the European Enlightenment of the eighteenth century. We were told that between the ongoing evolution and maturation of the human species, especially the freeing of our minds from the shackles of superstition and faith and replacing it with reason, and the astounding accomplishments and discoveries of science and technology, life will continue to improve. There may be setbacks, and still, on the whole, we are on a path towards a bright future. I’ve always been suspicious of this tale, and only more so over time. It’s not so much that I don’t see aspects of life that I trust have improved since hundreds or even dozens of years ago. It’s that I alsosee aspects of life that have gotten worse, some alarmingly so, within that same time period. This is true both on the material plane and even more so on the social plane. Compared to our pre-industrial ancestors, we have much more convenience, and less time, overall, to enjoy it. We have far fewer deaths from infectious diseases, and far more from degenerative ones. We have more choice, and less community. I was shocked, for example, when I first learned that there was a higher percentage of women faculty in universities in the 1910s and 1920s than in the 1970s! Even more so, when I learned that shortly after the end of the Civil War, for a short period of time, Black people were even elected to Congress – and then the Jim Crow system was installed which took decades to challenge and at least partially dismantle. Why my grief ultimately is the more pronounced is that I have some modicum of knowledge about the immensity of what it took to create the conditions for the US Congress and President to accept the Voting Rights Act in 1965. The amount of mobilization, the amount of love and courage, the amount of strategy and leadership, and the immense suffering of so many to achieve these goals are inconceivable to me at this time. All the more grief because here we are, once again being in a position where, if we want to protect the rights of some people to have access to the meager participation in decision making that electoral politics offers, we will need that same kind of genius and determination, because the legal recourse is no longer there. 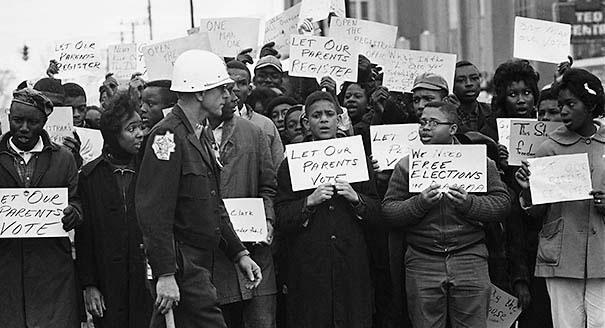 The children in this image from 1965 saying “Let our parents vote” are now in their 60s and have been able to vote all their adult lives, so long as they didn’t run foul of the New Jim Crow, but now may have to fight the fight over again for themselves and their own offspring. I sure hope this time around there will be more white people working with them than back then, willing to take risks to transform the system that still bars so many people from full access to basic civil and human rights. As to why this happened in the way that it did, I can only refer you to an analysis from Michael Lerner. I don’t have a word to add or take from this piece. It’s called Why “Voting Rights, NO, Gay Marriage, YES” from the Supreme Court? I urge you to read it. I urge all of us to never give up. This entry was posted in Uncategorized and tagged Civil Rights Movement, DOMA, Prop 8, Supreme Court, Voting Rights Act on June 29 / 2013 by Miki.